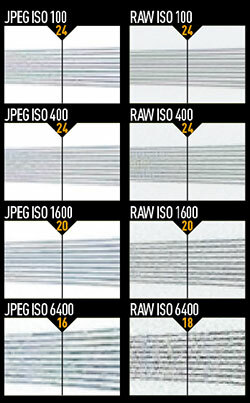 These images show 72ppi (100% on a computer screen) sections of images of a resolution chart, captured with the lens set to 50mm and f/5.6. We show the section of the resolution chart where the camera starts to fail to reproduce the lines separately. The higher the number visible in these images, the better the camera’s detail resolution is at the specified sensitivity setting. With the same sensor and pixel count, the performance of the Canon PowerShot S110 matches that of its predecessor. The only difference is that the new camera offers a high ISO 12,800 setting. Resolved detail is therefore respectable. However, other high-end compact cameras that have been released since the S100 have upped the bar concerning image quality, most notably the Sony Cyber-shot DSC-RX100. It is for this reason that the S110 scores 26 out of 30 rather than the 28 of its predecessor.